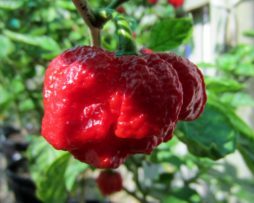 The Trinidad 7 Pot Brain Strain Red is just the red version of the Yellow Brain Strain. Very much the same taste and wrinkly pod shape….just in red! It has lots fruity pods on the bush. It tastes great and a real winner! The 7 Pot Congo bush grows some really big pods and lots of them. They just look like a huge Reb Hab and are very hot. Honestly, maybe not the best tasting 7 pot fresh but would probably make a great sauce. SR stands for a lady named Sara who shares many varieties from Trinidad with the world. 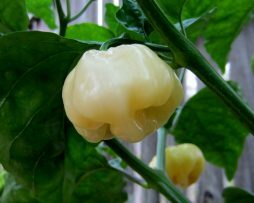 The White 7 Pot is also controversially called the Giant White Habanero. 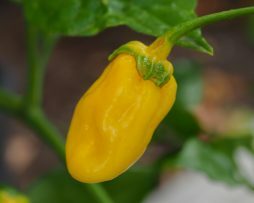 It is said that Grant Hustler released an F3 variety some years ago of the Yellow 7 Pot crossed with a White Hab. – resulting in this monster. Whatever you choose to call it, it’s an excellent all round versatile chilli. 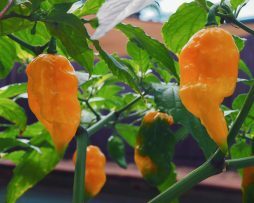 It has nowhere near the heat of a 7 pot, more like that of a Red Habanero. It is crunchy like an apple with a fresh and citrusy flavour. They start green and turn whitish yellow when ripe. They have a thick flesh and grow to a size of approximately 6cm x 6cm. 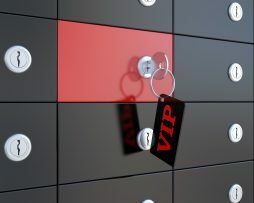 Another great one for your collection! 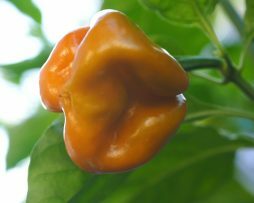 The Aribibi Gusano is a weird and wonderful looking habanero type chilli pepper. It originates from the city Aribibi in Bolivia and Gusano is the spanish word for worm – hence its name. 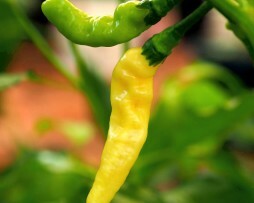 Obviously it is also known as “Caterpillar Chilli Pepper” because of its caterpillar look. 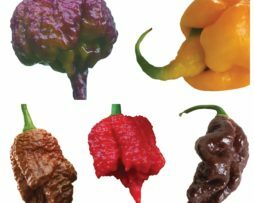 This is another relatively rare chilli that grows fairly compact into an umbrella like shape. Don’t let the little innocent shaped pods fool you this is a true hottie. Pods mature from a lovely light green to creamy white when ripe. They have a strong citrus flavour and the yield of the plants are very high. 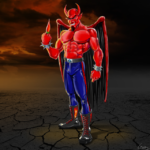 I’m BAD to the bone and pretty awesome looking too. 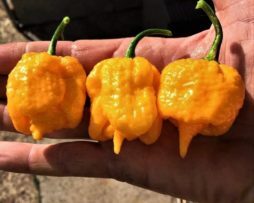 The Bad Brains chilli is an accidental cross discovered by the grower extraordinaire Wes Lane. Its most likely a cross with a Fatalli Yellow and possibly the Yellow Brainstrain. With that sort of heritage it just has to be a winner. 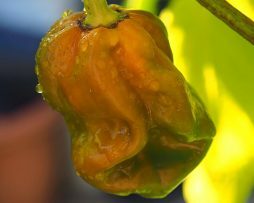 We love how it looks but its the flavour that is a stand out – sweet and thin walled it tastes very much like a fatalii with a tad more heat. 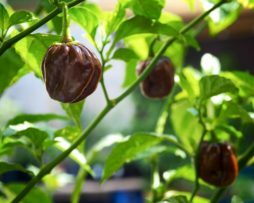 The plant grows to about 100 cm tall in a pot and the pods are 8-10 cm long and 3cm wide. 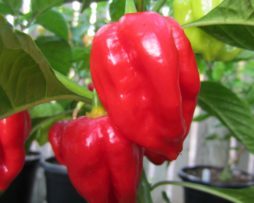 Another super prolific chilli variety we cant recommend enough.